EAST CLEVELAND, Ohio (May 23, 2013) —When a utility responds quickly in the wake of a natural disaster, it can make a world of difference for affected residents who need to feel secure and see progress on the path back to normalcy. As Superstorm Sandy struck the East Coast last fall, for example, power was knocked out to millions of homes and businesses. Upwards of 5,000 street lights operated by FirstEnergy were destroyed by flooding and 80 mph gusts of wind. FirstEnergy moved immediately to press GE Lighting’s Hendersonville, N.C., manufacturing plant into action. In just one day, nearly 40 GE Lighting employees built and delivered to FirstEnergy’s New Jersey territory 1,000 high-intensity discharge (HID) street lighting fixtures—the first part of the overall order. Mindful of the urgent nature of their work, the employees worked on a scheduled holiday to see the order through. On an average day, Hendersonville employees produce and ship about 3,000 HID and LED lighting systems to cities as big as Las Vegas and as small as Superior, Neb. Through an investment of $35 million targeting manufacturing efficiency and speed, Petersen and the Hendersonville team have transformed how lighting systems are made and how fast products move off the line and into service for customers. The facility has incorporated a new build-to-order “parts-pull system” that utilizes a GE Intelligent Platforms’ Proficy Software suite used by such companies as Nissan, GM and Anheuser-Busch. Incorporating principles of lean manufacturing, pull replenishment and Six Sigma, the plant’s 400 employees can ship orders in an average of six days or less, compared with a pre-transformation four- to six-week delivery. The team’s on-time delivery rate—the frequency that orders ship on or before the day targeted-is consistently more than its 95 percent target and often hits 98 percent or more. On an average day, the team of hourly and salaried employees produces and ships about 3,000 HID and LED lighting systems to cities as big as Las Vegas and as small as Superior, Neb. Products include GE’s Evolve™ LED Scalable Cobrahead Roadway Lighting Fixture, which earned the prestigious “Best-in-Class” award from the U.S. Department of Energy’s annual Next Generation Luminaires Competition and won the 2013 LightFair International Innovation Award category for Parking, Roadway and Area Luminaires. 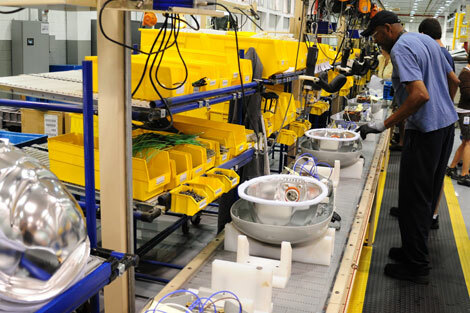 Since it was established in 1955, the Hendersonville plant has put more than 52 million lighting units into service. Because the new approach included improvements to all functions, from receiving an order to the material flow on the manufacturing side, employees started in September 2011 with one product family—a high-wattage Cobrahead roadway lighting fixture. Plant workers now apply new methods to the assembly of products tied to roads and streets, highways, interchanges, tunnels and underpasses, and they expect to fully adopt these efficiencies by September for commercial area lighting. Plant improvements are expected to continue through 2014. Since the transformation began, a number of new LED product offerings have been introduced, and the list continues to grow. All of these new products provide customers optimal energy savings and lower maintenance costs. This growing product portfolio includes outdoor lighting fixtures for commercial, institutional and government applications such as decorative post tops, industrial facilities and commercial areas and sites. GE Lighting also is able to fulfill orders for older-model fixtures. For example, a Southern utility customer requested a replacement HID fixture installed on its system two years previously. With the improved process, the order was fulfilled in just 10 days.